Interested in changing your Netflix region? Or traveling somewhere where Netflix isn’t available? 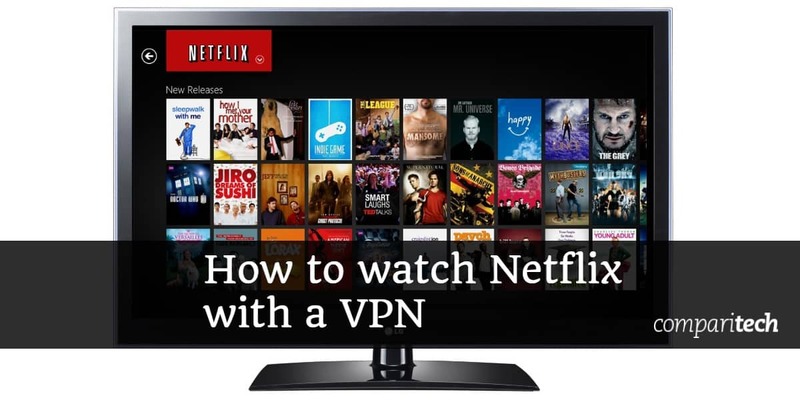 We’ll explain how to use Netflix with a VPN so you can watch your favorite version of Netflix from any country. With the right VPN, using Netflix abroad process is extremely simple. When you connect to a VPN, you’re given a new, region-specific IP address from the country your chosen server is in. Netflix relies on the user’s IP address to determine their location, meaning from its point of view, there’s no difference between a user who’s actually in a given country, and one using a VPN to spoof their location from abroad. First, sign up for a suitable VPN (we recommend ExpressVPN). Next, download and install the app, making sure to get the correct version for your device. Decide which country’s Netflix library you’d like to use and connect to one of your VPN’s servers in that country. For example, you’ll need a US server to unblock Netflix US. Go to the Netflix website and try playing a video. It should load right away, but if not, you can often fix this issue by clearing your browser’s cache and cookies, then refresh the page. HOW TO GET A PAID VPN FREE: Only looking for short-term VPN coverage? ExpressVPN’s 30-day money-back guarantee means you can use it risk-free while on vacation. You will have to pay upfront but can cancel at any point to receive a full refund, no questions asked. ExpressVPN offers access to a network of more than 2,000 high-speed servers across 94 countries. It’s fast enough for flawless HD (and 4K) streaming, and better still, offers exceptional unblocking ability. For proof, look no further than Netflix: ExpressVPN unblocks more than a dozen of the libraries we’ve tested it with, including the ones for the US, the UK, Japan, and Australia. This VPN keeps your activities hidden from prying eyes using 256-bit encryption, DNS and IPv6 leak protection, and a kill switch (in its desktop apps) that automatically stops all traffic should you disconnect from the VPN unexpectedly. ExpressVPN logs no personally identifiable information and accepts Bitcoin payments, meaning you can sign up and use the service anonymously. Need help? You can reach customer support 24/7 via live chat. ExpressVPN offers Windows, MacOS, Linux, Android, and iOS apps. There’s even custom firmware which makes it easy to install and use ExpressVPN on your router. BEST VPN FOR NETFLIX:ExpressVPN is our first choice for Netflix. It’s a fast, privacy-conscious VPN which takes your security seriously. Best of all, ExpressVPN includes a 30-day money-back guarantee so trying it is risk-free. NordVPN’s network is the largest of any major VPN, with more than 5,000 servers throughout 62 countries. That’s not all it has to offer, though: it’s also very fast and capable of unblocking several different Netflix libraries. A major advantage of this service is that you can access Netflix with any server since if you try to use a version that NordVPN can’t unblock, you’ll simply be redirected to the US Netflix site. This VPN keeps you safe using a combination of 256-bit encryption, a customizable kill switch (on all platforms but Android), and protection against port forwarding, IPv6, DNS, and WebRTC leaks. There’s also automatic malware-scanning and ad-blocking, plus multi-hop and Tor over VPN features. NordVPN has a strict no-logs policy but you can pay with Bitcoin if you’d like a little extra anonymity. If you need help, you can reach customer support 24/7 via live chat. NordVPN has apps for Linux, MacOS, Windows, iOS, and Android. Manual configuration is required for select network routers. POWERFUL BUDGET VPN:NordVPN offers a huge degree of freedom when it comes to streaming. It’s fast, includes numerous advanced security features, easily unblocks Netflix, and keeps no logs. NordVPN offers a 30-day money-back guarantee with all plans. CyberGhost is an easy-to-use yet powerful VPN built with streaming in mind. It has more than 3,400 high-speed servers spread across 60 countries, and users can see the current load of each, as well as the streaming service it’s designed to unblock. While many VPNs struggle with Netflix, CyberGhost has no such problems and grants access to many of the libraries we’ve tested it with. This service comes with several advanced security features including 256-bit encryption, a kill switch (in every version), an ad-blocker, a malware-scanner, and protection against DNS and IPv6 leaks. Further, CyberGhost doesn’t log any personally identifiable information, so there’s no need to worry about your activities being traced back to you. Live chat is available 24/7 in case you run into any issues. CyberGhost apps are available for Windows, MacOS, Android, and iOS devices. It can also be manually installed on Linux systems and select wireless routers. PrivateVPN might have a smaller network than most of its competitors (88 servers across 57 countries), but it’s ideal for watching Netflix abroad. Not only does PrivateVPN offer much faster speeds than many of its rivals, it also unblocks a greater range of content. Indeed, it unblocked most of the Netflix regions we tested it with, including libraries for the US, the UK, Canada, Australia, and Japan. Further, with six simultaneous connections permitted, you can stream freely at home and on the go. This service uses 256-bit encryption, protection against IPv6, WebRTC, and DNS leaks, and a kill switch (in its Windows app) to keep your activities private at all times. While you can sign up almost completely anonymously by paying with Bitcoin, PrivateVPN doesn’t keep any logs at all, and as such, your activities cannot be traced back to you. Its live chat support service is available 22 hours per day (it’s offline from 1-3PM PST), and the staff can remotely configure the software for you, if you’d like. PrivateVPN apps are available for Windows, Android, MacOS, and iOS. This service can be manually installed on Linux systems and select internet routers. FAST AND VERSATILE:PrivateVPN is very fast, unblocks more Netflix libraries than most, keeps no logs, and includes strong security features. A 30-day money-back guarantee is included. Surfshark has around 500 servers spread across 50 countries and is fast enough for flawless HD streaming. It’s also capable of unblocking multiple Netflix libraries including those of the US, the UK, Japan, and India. Additionally, Surfshark has one major advantage over its rivals: there’s no limit to the number of devices you can connect at one time. 256-bit encryption is enabled by default, and this service offers a kill switch, DNS and IPv6 leak protection, automatic ad-blocking and malware-scanning, split tunneling, dual VPN functionality, and the ability to obfuscate your traffic. Surfshark doesn’t log any details that could identify you. 24/7 live chat is available in case of any problems. Surfshark offers apps for Windows, MacOS, Android, iOS, and Amazon Fire TV. It works on Linux-based systems and select routers but must be configured manually. STREAM SAFELY ANYWHERE:Surfshark is a reliable VPN that can unblock multiple Netflix libraries and puts major emphasis on your security and privacy. Better still, it comes with a 30-day money-back guarantee. Can I unblock Netflix with a free VPN? While you might be tempted to use a free VPN, we advise against doing so, for several reasons. Firstly, there’s the performance: free VPNs usually don’t have enough servers to cater to all of their users. This causes near-permanent network slowdown, which is hardly ideal for HD streaming. Additionally, Netflix has invested significant resources to block VPNs, so in all likelihood, you won’t be able to watch anything in the first place. VPNs have high running costs, whether they’re free or not. As such, free services find ways to generate income without billing the user upfront. Free VPNs will often have large, intrusive ads that can only be removed for a monthly fee. Others make money by storing tracking cookies on your device, allowing the VPN provider to monitor your activities and create a consumer profile that can later be sold to advertisers without your knowledge. What should I do if I still can’t access Netflix? So you’ve connected to one of your VPN’s servers, tried to access another country’s version of Netflix, and received an error saying You seem to be using an unblocker or proxy. Please turn off any of these services and try again.” There are a few different reasons why this might be happening, and below, we’ll explain what you can do to fix the problem. Start by clearing your browser’s cache and cookies. Some geo-blocked sites store a cookie on your device if you try accessing them without a VPN. This cookie simply tells the site not to let you enter, but by clearing it and trying again, you might fix the issue. Try closing your browser and reconnecting to the VPN. You might be using an IP address that Netflix has blacklisted and by reconnecting, you have a chance at securing a different one. Try asking your VPN provider which server to use. Sometimes, when Netflix improves its VPN detection measures, it takes VPN companies a while to catch up. Despite this, there’s usually at least one working server in high-traffic areas. Which Netflix region offers the most content? Netflix doesn’t have a publicly-available country-by-country breakdown of its available content, so we’re reliant on third-parties to find out exactly what is on offer around the world. According to Finder, the US currently has the largest Netflix library, with a total of 5,852 titles (4,091 movies and 1,761 TV shows). Netflix Japan is a close second, however, with 5,634 titles (4,326 movies and 1,308 TV shows). There’s huge variation in terms of catalog size from one country to another, however. For instance, Netflix Iran has just over 2,300 titles in total. Usually, this is because Netflix only has the rights to show titles in specific countries, but local laws also have a part to play. For instance, Saudi Arabia has laws against the transmission of “material impinging on public order, religious values, public morals, and privacy,” and recently used this to block the release of a show which represented the Crown Prince in a negative light. 9 Can I unblock Netflix with a free VPN? 10 What should I do if I still can’t access Netflix? 11 Which Netflix region offers the most content?